I just finished reading the last pages of this book, and my mind is filled with its images. It is a touching, heartbreaking and soul-lifting kind of book. I'm usually careful about which WWII books dealing with the Holocaust I choose to read, because I am sensitive and easily moved to tears. This one has a dual timeline and a mysterious painting so I couldn't resist. And I'm so glad I read it! New York art dealer Sera James has devoted the last two years of her life to finding the painting of a young violinist with piercing blue eyes. It has kept her busy since the day her heart broke when she was left at the altar. Through her research, she meets William who is also searching for the painting but for different reasons. The subject of the painting is Adele Von Bron, a talented Austrian violinist who was part of the aristocracy and whose father was a high-ranking member of the Third Reich. 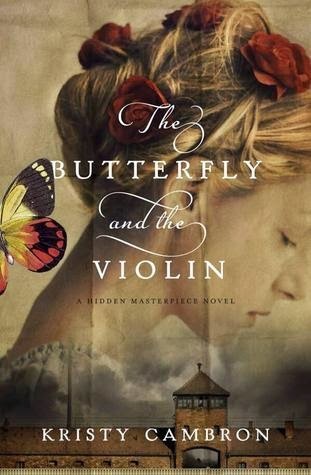 Adele leads a privileged life until she follows her heart and helps Vladimir, a fellow musician, smuggle Jews out of Vienna. Her whole world changes when she is condemned to Auschwitz. I enjoyed the dual timeline, Sera's story in modern day NY and Adele's from 1939 to 1945. The modern story gave me some reprieve from the grim and horrific setting of Auschwitz's concentration camps. But I liked Adele's story more than Sera's. The characters were more developed in the historical part and the love story more compelling. I didn't really empathize so much with William and Sera's dilemma's as I did with Adele's. I found Sera cried too much and it was a little too coincidental that William turns out to be such a God-fearing man. Their love story felt too rushed for me. I did like how the two stories converged. Most of all, I liked learning about how the prisoners were still able to create beautiful art even in the midst of such evil and cruelty, in hiding, under starvation and weakness. It is an ode to the human spirit and resilience. The author states in her notes at the end of the book: "Found in the rubble of partially destroyed warehouses and old barracks of Auschwitz were more than 1,600 pieces of art that survive to this day." I was astounded by this fact. What's more, the prisoners who were musicians were required to form an orchestra and perform while prisoners were brought to the camps and torn apart from family members or when they marched to the gas chambers to their death. The author deftly explores the feeling of these women as they had to perform such hideous duties for the SS soldiers or be killed. I will always remember Adele's story, a non-Jew, who willingly put her life at risk for what she believed to be right. I applaud the author for writing such a beautiful story, filled with hope and human strength. I read this book every chance I got, snatching stolen moments in my otherwise crazy schedule this week. If you like WWII stories with heart, I encourage you to read this one. Oh, and one last thing, both the cover and the book title are perfect for this story. Note: This book is rated C = clean read. Even though part of the story takes place in a concentration camp, the violence is not graphic, although the situations are horrific. They are for a mature audience. Disclosure: Thanks to the publisher and to Litfuse for sending me this book for review. I was not compensated in any other way, nor told how to rate or review this product.